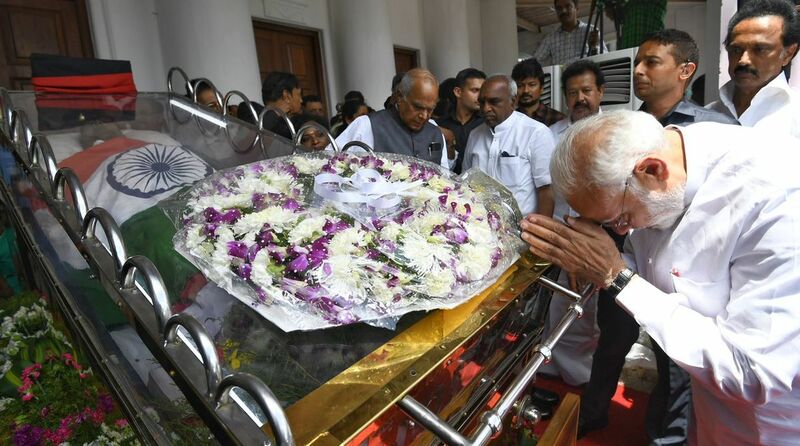 PM Narendra Modi laid a wreath at Karunanidhi’s feet and bowed before his mortal remains, paying his respect to the late leader. Prime Minister Narendra Modi paid tributes to late DMK chief M Karunanidhi at the Rajaji Hall in Chennai on Wednesday and met the members of his family. Clad in whites, PM Modi laid a wreath at Karunanidhi’s feet and bowed before his mortal remains, paying his respect to the late leader. He later consoled the DMK chief’s family members, including his wife Rajathi and son MK Stalin. PM Modi, who arrived in Chennai from New Delhi by a special flight earlier in the morning, was accompanied by Tamil Nadu Governor Banwarilal Purohit, Defence Minister Nirmala Sitharaman and state unit leaders of the BJP, besides those of the DMK and the AIADMK. 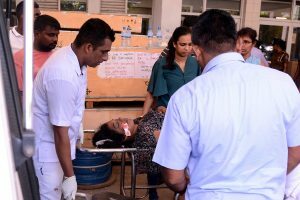 After going around the casket in which the body lay wrapped in the Tricolor, the Prime Minister patted Stalin, Karunanidhi’s son and political heir, and Kanimozhi, daughter and MP, and comforted them. Karunanidhi, 94, died at a private hospital in Chennai on Tuesday following prolonged illness. After paying tributes to the veteran leader, PM Modi tweeted: “In Chennai, I paid tributes to an extraordinary leader and a veteran administrator whose life was devoted to public welfare and social justice. In Chennai, I paid tributes to an extraordinary leader and a veteran administrator whose life was devoted to public welfare and social justice. Congress president Rahul Gandhi is also likely to visit Chennai to pay his homage to the former chief minister of Tamil Nadu. Earlier today, Tamil Nadu Chief Minister K.Palaniswami and Deputy Chief Minister O. Panneerselvam paid their last respects to Karunanidhi.